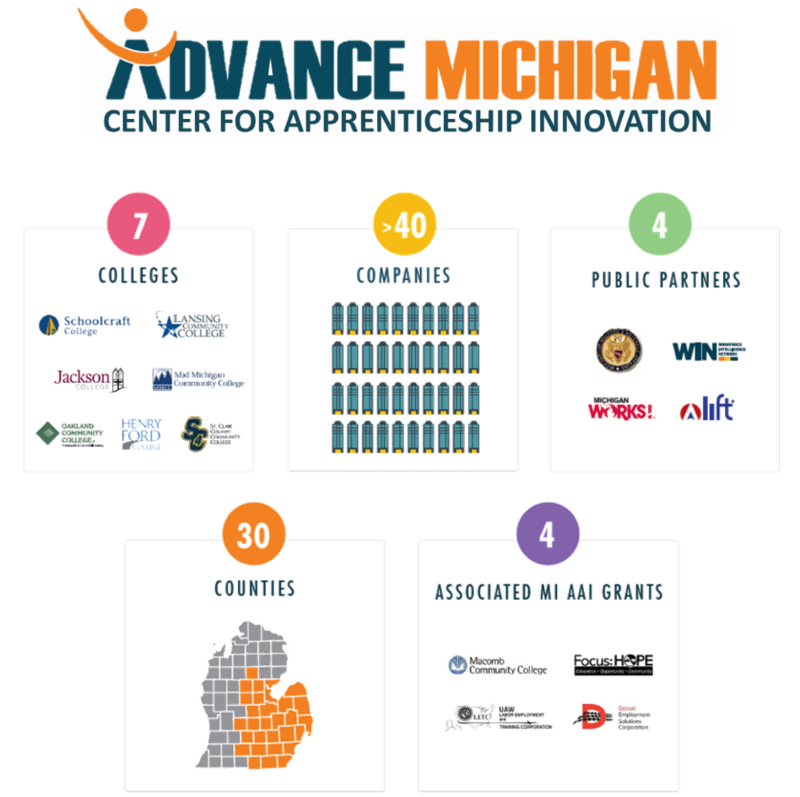 The Advance Michigan Center for Apprenticeship Innovation (AMCAI) is a $4 million American Apprenticeship Initiative grant recipient tasked with expanding regional apprenticeship through statewide innovation. AMCAI covers 13 counties in Southeast Michigan and promotes the overall goal of expanding and enhancing Department of Labor (DOL) Registered Apprenticeships. Led by the Southeast Michigan Community Alliance (SEMCA) and Workforce Intelligence Network for Southeast Michigan (WIN), AMCAI is comprised of six Southeast Michigan community colleges—Henry Ford College (HFC), Lansing Community College, Mid-Michigan Community College, Oakland Community College (OCC), Schoolcraft College, and St. Clair County Community College (SC4)—along with many local and regional corporate and workforce and economic development partners. This partnership of community colleges and other community partners represent AMCAI, which will focus on establishing and expanding apprenticeship programs responsive to the evolving technical needs in high-demand automotive and transportation sectors, along with expanding into non-traditional apprenticeship occupations like in healthcare and information technology. AMCAI will serve 853 individuals, both new and incumbent workers, by October 2020, with 28% of participants being of underrepresented populations. Drawing from innovation of past and current projects such as the DOL TAACCCCT funded Multi-State Advanced Manufacturing Consortium (M-SAMC) and the Michigan Advanced Technician Training Program (MAT2), AMCAI will continue to expand and enhance workforce education and apprenticeship. For more information, please visit AMCAI’s apprenticeship website at MIapprenticeship.org. The Michigan Educators Apprenticeship and Training Association (MEATA) is hosting the 2018 Spring Conference from May 22-May 25, 2018 at Holiday Inn Resort West Bay Beach in Traverse City, Michigan. This must-attend annual conference for anyone involved in the development and delivery of U.S. Department of Labor (DOL) Registered Apprenticeship programs in the state of Michigan. To learn more about the conference, register to attend, hotel accommodation information, and more, please click here. Check out AMCAI's Michigan apprenticeship website! MIApprenticeship.org provides resources for employers, those considering apprenticeship, and workforce and education partners involved in developing registered apprenticeship programs. Want to know the ROI of an apprentice? Check out AMCAI’s ROI calculator to review the ROI of an apprentice for various occupations, or request data for an occupation you are developing an apprenticeship for! 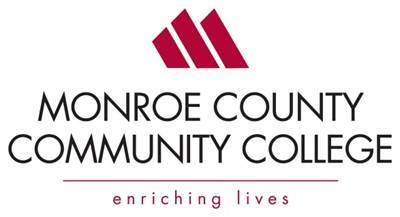 Macomb Community College was awarded a $3.9 million grant to fund Michigan Apprenticeship Program Plus (MAP+). The project will target apprenticeship pathways in IT and manufacturing occupations. MAP+ will register a new apprenticeship in Digital Sculpting, an area with growing hiring needs in the auto industry, and will work with Federal Financial Aid and the United Auto Workers to find innovative ways to leverage funding to create more apprenticeship opportunities. The program will serve 600 apprentices, in the two largest metropolitan areas of Michigan. Employer partners include Atlas Tool, Formtech and Autocam Precision Components Group. Focus: HOPE was awarded a $3 million grant to fund the Focus: HOPE American Apprenticeship Program. Focus: HOPE has over three decades experience providing the residents of Detroit with gateway skills to seek better employment. The funds will be utilized to register four new apprenticeship programs, expand three existing programs and promote career pathways through education during apprenticeship. The program will serve 300 apprentices in targeted occupations in the Advanced Manufacturing and IT industries in the State of MI. UAW-Labor Employment and Training Corporation was awarded a $5 million grant to fund the UAW American Apprenticeship Initiative Program. The grant will used for the development of new registered apprenticeship and pre-apprenticeship programs and for modification of existing programs. A number of underserved workers will be assisted, including 500 job seekers and 975 incumbent workers in high skilled occupations within the Advanced Manufacturing Industry.